Wow - it feels like you are looking at the future when you watch these self-organizing robots designed by MIT researchers work together to form different shapes. Each M-block is a marvel of technology - about the size of a few ice cubes, they contain a process motor controller, flywheel, braking mechanism, electronics, radio, battery and numerous magnets. 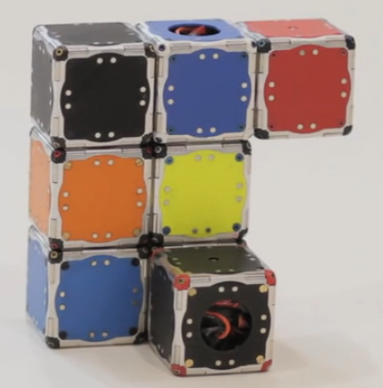 Moreover, these modular robots are unique because they are able to jump - its truly fascinating to watch them jump as they connect with one another while making different shapes - thanks to angular momentum. If you start to think about these devices getting smaller - it may not be long before these robots can form a number of objects which you may need in your home like a stepping stool, temporary nightstand and more. One wonders how this technology may actually evolve and somehow merge with 3D printing tech to allow the creation of even more temporary objects. The bottom line is the future seems to be getting closer by the day and self-organizing robots may be a huge field which changes the way we think about many of the fixed objects we rely on today.